Even the mighty e-commerce giant couldn't fight the market swoon in December. Shares of Amazon (NASDAQ:AMZN) were coming back down to earth last month as the high-valued growth stock succumbed to pressure from the broader market sell-off. According to data from S&P Global Market Intelligence, the stock coughed up 11%, though that was only slightly worse than the 9.5% drop in the Nasdaq. There was no single piece of news driving Amazon shares lower. Rather, the stock seemed to fall on the same combination of concerns that drove the market down, including rising interest rates, a potential slowdown in the economy, and worries about trade tensions with China. As the chart below shows, Amazon's slide closely mirrored that of the S&P 500 and Nasdaq. Perhaps no stock better defines a growth stock than Amazon, the tech giant that has stretched into diverse industries including e-commerce, cloud computing, video streaming, and voice-activated technology. Amazon's relentlessness in pursuing emerging technologies along with a suite of competitive advantages centering on its Prime loyalty program has made it the best-performing stock of the last 20 years as it's returned a whopping 76,500% since its 1997 IPO. The company has also been a big winner in the decade since the financial crisis. 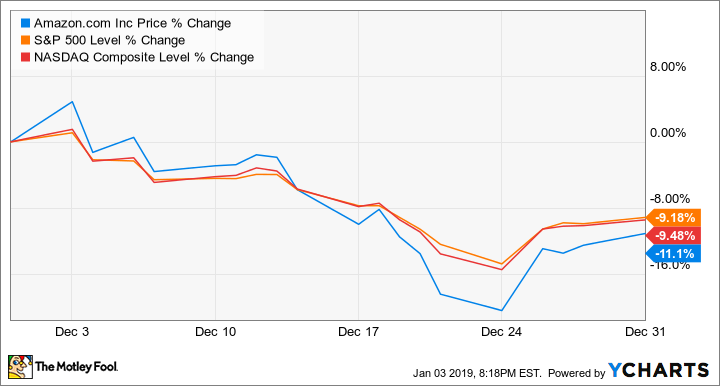 However, market sentiment seems to be changing, and growth stocks, especially the FANG group that had done so well, are rapidly falling out of favor as investors flee to safety. Amazon's profits have been rising quickly, but the stock is still expensive by conventional measurements, trading at a P/E ratio of 92, meaning it could be vulnerable to a further pullback in the market. The stock is now down 27% from its all-time high just a few months ago, a sign that the prior run-up in the stock could have been overdone. Despite the sell-off, Amazon's competitive position is strong and getting stronger, with rapid growth in high-profit segments like advertising and cloud computing, a plan to open new Whole Foods stores, and continuing dominance of e-commerce as it controls about half of online sales in the U.S. However, Amazon is highly dependent on the American consumer, meaning the company and the stock would likely suffer if a recession were to hit, as some analysts now fear. While Amazon's profits should continue to ramp up, a weakening economy could hammer the stock. At this point, the only thing Amazon investors can be assured of is that the stock's volatility is likely to continue well into 2019.